The Kershaw Alaskan Blade Trader knife has three blades that, together, make hunting big game easier. One blade is a big gut hook ulu-style blade that is made from high quality AUS6A stainless steel. The other is a 420J2 stainless steel straight edge blade for hunting, and the other is a saw made from steel. The copolymer knife handle has a quick release built into it so that you can swap between blades in a matter of seconds. 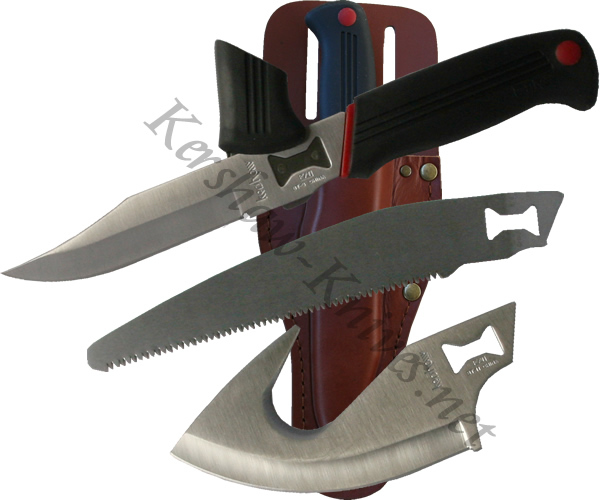 All three blades and the knife are carried in a sturdy leather sheath made for your belt.